Click on the calendar below to see a list of events relating to the schools of the East Cluster. Here are the Seiberling students who met their independent reading goals for March. Akron Public Schools Superintendent, David James, delivered his State of the Akron Public Schools message on Feb. 28 at the Tangier. Here is a summary of his address, here is a complete transcript, and here is the video. • Don Joseph Toyota donated a 2007 Toyota Solara valued at $2,500 to the Auto Tech classes at East. • Rev. Donald Register donated $500 to fund the Margaret and Urile Wyche Scholarship Fund at East. • Phillips Chapel CME of Akron donated coats, gloves, and clothing to Seiberling. • Bridgestone Americas donated a battery tester & tire pressure monotor valued at $2,820 for East's Bridgestone/Firestone Auto Care Center. • One Family Under Guard World Outreach Ministries donated coats & shoes for students in need at Robinson. • Peak Physical Medicine LLC donated $200 to Barber to be used for student incentives. • Excel Tire Gauge donated three digital wall-mounted tire gauges, valued at $2,085, for use in the Complete Auto Care Center at East. • The First Presbyterian Church of Hudson donated $178 to Barber to be used at the discretion of the principal. • Scott S. Swierkosz donated $500 for the Auto Tech Lab at East. Every year the Ohio Dept. 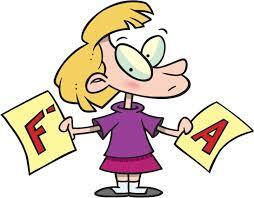 of Education issues a report card for every school in the state. Evaluated are factors such as test scores, reading competency, and graduation rates. Listed below are the report cards for the schools of the East Cluster for the 2017-18 school year. If you have questions, comments, or suggestions regarding this web site or its contents, send us an e-mail. The Akron Mayor's Youth Leadership Council (MYLC) is looking for new members for the upcoming school year. Mayor Dan Horrigan states, "I am seeking motivated young people to represent their peers in conversations with me and my staff on important issues like violence, education, neighborhood development, and ways to attract and retain young people in our city. Members will learn more about how city government works, how to qualify for a MYLC high school internship, and develop leadership skills that will set them up for success in college, career, and life." Any student living in Akron who will be entering 9th through 12th grade for the 2019-2020 school year and maintaining at least a 2.0 GPA is invited to complete an application. Looking for a Summer Job ? 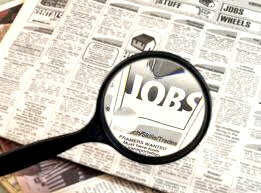 Ohio Means Jobs of Summit County is now accepting applications for this year's Summer Youth Employment Program. The program is designed for Summit County residents who will be between the ages of 14 and 17 as of June 1 and live in a low-income household. The period of employment will begin on June 10 and end on August 2. Student employees will work no more than fifteen hours a week. Interested applicants must apply on-line and will be registered on a first-come, first-served basis. Barber teacher, Katie Lovell, has been selected as one of four elementary teachers of the year for the Akron Public School System. Lovell is pictured below, at the right, along with Barber principal, Ranea Williams. She will be recognized at the Teacher of the Year Banquet on May 9. 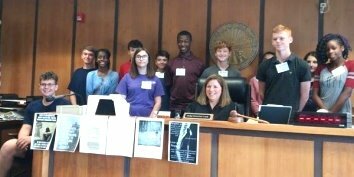 Thanks to fifteen student-artists at Mason, a new piece of art hangs in the courtroom of Summit County Probate Court Judge Elinore Marsh Stormer. 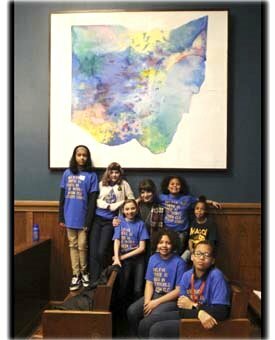 The students, guided by art teacher, Anne Lackney, created the 7-by-7-foot watercolor canvas of a map of the state of Ohio. appearing in the Akron Beacon Journal. 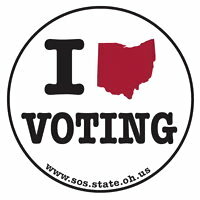 Ohio Secretary of State, Frank LaRose, has announced a design contest to create a new voting sticker for the state. Any Ohio student in grades 6 through 12 is eligible to enter. Deadline for entries is April 28. Complete contest rules, guidelines, and entry forms are available here. 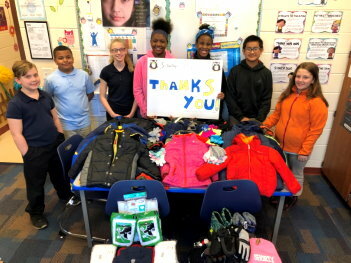 Members of the Seiberling LEADS team show their appreciation to Phillips Chapel CME Church on Iroquois Ave. for their gifts of coats, gloves, and other clothing donated to the school. Creating art with computer code? That will be the goal of this year's Code Hopper Challenge sponsored by the the College of Education at the University of Akron. The event, open to girls 11-18 throughout northern Ohio, will take place Saturday, May 4, from 9:00 a.m. to 4:30 p.m., at the Akron Art Museum downtown. Each team will be assisted by a coach, and teams will be classified according to level of experience: beginner, intermediate, or experienced. Registration is $10 per girl and includes a box lunch and t-shirt. Here are complete details, pictures from last year's event, and an on-line registration form. For a list of resources helpful to residents of the East Cluster neighborhoods , click here. Reporting on the news of the East Cluster since 2002. Hope you learned something new while visiting our web site.